do my actions support that value? what, if anything, blocks me from living my values? what small step can I take right now to put that value into action? I offer up some of my own personal examples. I find myself wanting to eat food that is harmful to my health. It usually happens when I feel deprived of these foods, it makes them harder to resist. do I connect with them or show them that I care? I could do a lot better. I often take them for granted. most of my family lives far away from me…making it an “out of sight – out of mind” kind of thing. how much time and effort do I spend on my business? Am I doing all that I can to help my business prosper? Sometimes I feel like I’m doing a lot but mostly I feel like I’m just spinning my wheels. instead it letting it just sit there, read the book I checked out of the library about how to run a small art/craft business…and actually do the exercises in it! how often to do I create new art? Do I do anything to improve my skills. I seem to go in spurts. I’ll create for a while and then nothing for a long time. Once in a while I’ll take a class or workshop. most times I feel like everything else is more important than doing my art…that it’s a luxury. Sometimes I even feel guilty about taking time to do my art. earlier in the year I declared that I wanted to spend at least 30 minutes a day creating some form of art. Unfortunately, I let this idea get away from me. Time to put it back into action. Hopefully my examples give you a feel for what this month’s mandala is all about. Granted these are written examples. With this month’s mandala we can take a more creative approach by expressing these values within each section of the mandala in an artful/crafty way…MOST IMPORTANTLY, MAKE IT FUN! 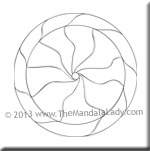 Ponder this as you color this month’s mandala. MotM Gallery: I would love to see your colorings of the monthly mandalas and be able to add them to a slideshow on this blog site. For the most part I feel like these posts just go out into the ethers without knowing if anyone reads them or even colors them. “Community Art Project” I’m working on a local community art project here in Corvallis, Oregon entitled: “The Time for Peace is Now” where I’d like us to create as many origami doves and colorings of doves to put into the project. I made it so that ANYONE can participate in some way regardless of where they live in the world. Read more about it on the “community art project” page of my web site. Please feel free to share this project with friends and family. The more doves we have the bigger the project!